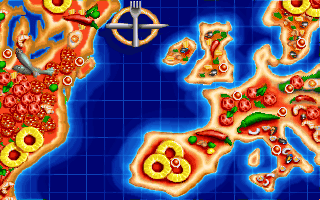 The key with the plane calls up the pizza ... sorry, map. Now you can choose which city you want to travel to. After clicking on the appropriate button the price of your flight ticket will be displayed. Moreover the name of the company with the highest turnover in that city will be shown. If you click again on the price, you will fly to that city. 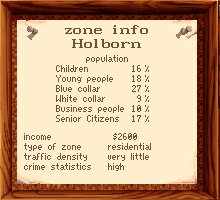 The latest data of the city you have left will be saved onto your saved game disk PIZ-GAMESAVE (AMIGA only) or onto your hard disk in the GAMESAVE directory. They will be reloaded when you return. If you are carrying any weapons at this stage in the game, you will take them with you to the other city. This menu item refers only to your character or those of the other players and their values. If you click on the CHARACTER key, you will be taken to your personal character menu. 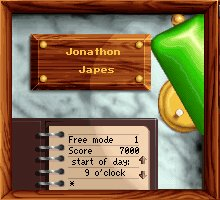 Here the game mode is shown, and the time when you want to get up the next morning (normally 9.00) is displayed in your note book. You might need more time for your activities. You might want to burgle one of your competitors, which can only be done at night See section 'CLOAK-AND-DAGGER OPERATIONS". It is not advisable to get up before 9 o'clock very often because your health value and you yourself might suffer considerably. Moreover the longer working day will use up more energy which you will not be able to replace completely during the following night. You should also remember that the end of your working day depends on your energy value. You can stop working between 3 pm and 11 pm. Press the switch on your desk lamp to take a couple of days off. You can set the number of days you want to take with the two arrows in the box. If you go on holiday, you leave the game for the chosen time period to recuperate. Meanwhile the other players - humans as well as computer players continue the game. The longer your break, the more your character can relax. With every day off, your health value will increase by a certain number of points depending on your age. The younger your character is, the more good the holiday will do him and the shorter the time needed to recuperate by a certain number of points. At the beginning of the game you should avoid going on holiday, otherwise you might give the competition too much of a head start. You would risk missing new trends, market changes or important newspaper items. Also your restaurants would be an easy target for attacks and any other nasty activities your competitors might think of. Nothing is more depressing than coming home from a holiday feeling fresh and relaxed - only to discover that you have gone bust in the meantime! Once you have got a good grip on your restaurants by entering into long-term supply contracts, employing managers and ensuring you have the necessary cash to cover running costs, you can and should spoil yourself from time to time. If you are relaxed and healthy you will be a lot more active and successful than if you are sickly and exhausted and have to stop work at 3 pm because you have run out of energy. 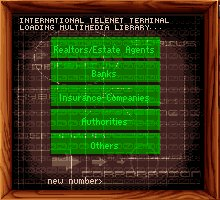 Using the two arrow keys of the key pad, you can go to the player whose data you would like to look at. If you press the CHARACTER VALUE key, the values for health, energy etc. will be displayed. For detailed information see the section THE PIZZA TYCOON CHARACTERS. 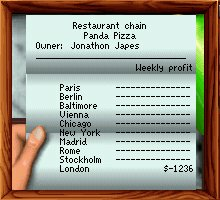 By pressing the COMPANY key you can cal up a list of cities in which you have restaurants and the weekly profits and losses of these branches. Pressing the CURRICULUM VITAE key will take you to this menu item. All major actions you take are noted and appear along with the exact date in your curriculum vitae. This means that you can trace the day you made your first million or the day a restaurant of your chain was awarded the title "Most beautiful pizzeria in town". Browse through the pages of your CV using the arrow keys. CVs can be saved separately so that other players can use them as missions. Make sure that your position in both worlds improves simultaneously - that will give you the best chances! 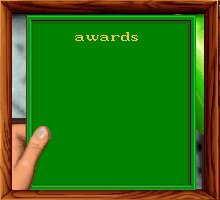 All award ceremonies, apart from those for the 'Pizza of the Year" and the 'Imitator of the year', take place every two months. The mayor always announces in advance when and where the ceremonies will be held. If you think you have a good chance of winning a prize, you can transfer the necessary financial contribution to the account named by the mayor and appear at the said place on the appropriate day - and on time! Then you will find out whether you are the lucky winner who will receive an award. The competition for the "Pizza of the Year' only takes place at the end of every year. Anyone can take part and financial contributions are not necessary. Your aim is to present a new pizza creation and receive high marks from the jury. The pizza baker with the highest marks will be awarded the "Pizza of the Year" Medal. For one year, he will also be allowed to advertise his creation in his restaurant as "Pizza of the Year" (with the appropriate year). The title "Imitator of the year" is awarded every year on the 30th of July. Here the medal will be presented to the cook who has won most pizza competitions (at least 5). The target CV is only used if you are playing in mission mode. You are given the CV that you will have to "re-live". At every stage of the CV a percentage will be displayed, telling you how closely you have managed to stick to the given career. Use the arrow keys to scroll through the other players. Apart from the CV with private information, you have access to all files concerning your competitors. The ARROW keys are also used to turn the pages of your own CV. Everything you save will be stored on your saved game disk PIZ-GAMESAVE (AMIGA only) or in the GAMESAVE directory (hard disk only). Similarly, old games will be searched for either on your PIZ-GAMESAVE disk (AMIGA only) or in the GAMESAVE directory on your hard drive. On saving, the extension ".GAM" is added to game files, ".CHR2" to character files and ".MIS" to mission files. The extensions are added automatically - you need not type them in. Loads a previously saved game. If you choose OLD GAME, a list of all previously saved games will appear and you can select the game of your choice by clicking on it. If you do not want to load any of them, simply click somewhere outside the box. Amiga users: If you are playing from disk, the settings are also stored under "PIZPREFS" on your saved game disk PIZ-CON1. Quits the game and takes you back to Workbench or DOS. You can and should advertise your restaurant chain. Your possibilities range from a simple flyer handed out in the street to the production of your own commercials. Click on the ADVERTISING key. This will take you to the advertisement overview where you will see which marketing activities are currently in operation, how many more days they will continue for, how much the different types of advertisements cost you every day and how effective the campaign is (shown as a percentage). The selected marketing activity is highlighted. View/Advertising: Here you can have a closer look at the advertisement. Shopping: Starts a marketing campaign of the selected type. Turn Page: You can determine the length of the marketing campaign (at least 7 days). You can also extend its duration after it has already started. After you have left the menu, the campaign can still be extended but not shortened. You can follow a selected marketing campaign by clicking on it. Flyers - Choose the number to be printed. Posters - Choose the graphics. 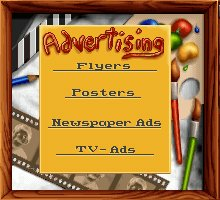 Newspaper ads - Choose your individual slogan from a number of text blocks and determine its size using the arrow keys. The effectiveness of the ad depends on the contents of the slogan. If you have chosen a slogan and decide later that you do not like, you cannot stop the campaign because the marketing agency will already have started the preparations. All you can do is cut costs by choosing a small advertisement format and a short duration for the campaign. TV ads - Choose the commercial you like best. Once you are happy with your settings, press the SHOPPING key again to conclude the contract. With the exception of newspaper ads, you can cancel the whole campaign by pressing the BACKSPACE key. Expensive advertising campaigns only make sense if you own several restaurants. All information on this panel refers to the part of town in which you currently are, or, if the last screen showed the overview map, the part last displayed in the status window. On this panel the population is divided into several groups. You need this information to adapt your restaurants in this area (their interior design, the menu and the prices) to your potential customers. Here the current situation on the property market in the area is illustrated. "Availability of commercial buildings" shows you how probable it is that business premises will be let or sold. In highly frequented or densely populated areas with a great deal of traffic, a shortage of free business premises might make it difficult for you to find suitable localities to rent or buy. The number of business premises for sale or rent is shown at the bottom of this page. The information on rent and price levels per square meter is particularly important. They include an average value of the costs you will have to meet if you want to open a restaurant in this area. “Trend" tell you how property prices are likely to develop. These are long-term trends which determine how prices will develop for months to come. Here the general economic trends are displayed. One of the most important pieces of information you need if you want your restaurant to be a success refers to your customers' tastes. Obviously you want to sell as many pizzas as possible, so it is vital to study the eating habits of the different groups within the population - especially when creating your own pizzas. It is vital to satisfy the tastes of as many customer groups as possible. The better you can satisfy the customers’ tastes, the more pizzas you are likely to sell. If you click the left mouse button somewhere within the table, the taste of the different groups will be illustrated in detail by values between 0 and 100%. 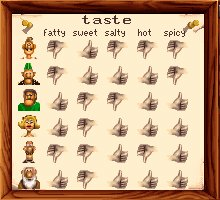 However, if you find 100% under SPICY in the bottom line, then you know that the taste buds of the elderly have become so weak that they need lots of spices on their pizzas. Otherwise they might not notice that they are eating pizza at all and think they are sinking their false teeth into a beer mat. These are only two examples. The tastes of the different groups change over time, and occasionally there can be a downright revolution. Generally, however, customer tastes are fairly constant and changes only occur very slowly. Under the menu heading "Cooking", every ingredient is assigned a specific taste value in the status window. As well as long-term customer taste, there are short-term trends that only last a few weeks and apply to all groups. If you are quick to spot these trends and adjust your menu accordingly, your restaurant might be the flavor of the month. Every now and then, for example, some crazy professor suddenly discovers that cucumber makes you slim. So if you have a pizza with lots of cucumber on the menu, people will be queuing round the block. Trends are expressed in figures. Positive values mean that the relevant ingredient is IN. An ingredient with a negative value, however, is most definitely OUT. Something that remains popular over a certain period of time. The popularity of the ingredient concerned reaches a maximum or minimum, only to fall or rise again at the same rate. The popularity soars to a maximum and then slowly falls again. Hew popular is a certain pizza? The charts are calculated on the basis of the cumulative sales figures of the last seven days. Information includes the ranking, last week's ranking, the name of the recipe, the owner and the sales figures for the previous week. Your pizza creations are sure to shoot to the top of the charts very soon. But skill and quality are not the only things that count. Chart rankings are based solely on sales figures. So it is important to spread your restaurants widely in order to sell the greatest possible number of pizzas made according to a certain recipe. This information panel shows the turnover of all eight restaurant chains at a glance, so you get an overview of your competitors' respective positions. The color of their businesses corresponds to the colors on the map. The market shares tell you how big the share of each restaurant chain is in the market as a whole. The paper is an important source of information. Use it whenever you make business decisions. The paper picks up the trends of tomorrow and even the day after tomorrow before they are shown in the trend info of market research. So if you read it you can react accordingly. Broccoli prices are on the rise! Get a large stock in now! Find out whether interest rates or property prices are changing or whether import or export barriers are being introduced for certain goods. Your income and expenditure are split into separate categories and listed for the current and previous month. If you click on these categories, you will see a window showing the results of your individual restaurants. "Orders". "Repayment" and "Miscellaneous" cannot be split up according to the individual restaurants. Your restaurants are displayed in a clearly lad out list. On the left you can see where the restaurant is located and on the right the most important information on this restaurant. This makes it very easy to compare your restaurants with each other. The development of your bank account for every week over the entire year can be displayed. The unit in which the numbers between 0 and 10 on the vertical axis are to be interpreted is shown above the graph. This will change when necessary, so that all sums of money are always displayed in the correct relation to each other. This is an overview of your current credit status, showing how much you have borrowed from each bank and the conditions of the loans. The remaining term of each loan is given in months. Here you can see what insurance you have taken out with which company as well as the monthly premiums. This list shows the price of any property you have bought and the monthly rent of rented premises. The balance sheet gives you an overview of your assets and liabilities. Where has your money gone and where is it coming from? On the left you can see the assets you own or which are available to you. You will notice that only a small proportion is available in cash. Most will consist of property, furniture and machines. Not every transaction affects your profit. For example, if you buy furniture, part of your money will be entered under the heading of furniture and fittings, but the total value of your assets will remain the same. Don't worry if at first you see a loss written in red ilk on the left side of the balance sheet. This is completely normal and arises from your investments. You can only make a profit if you sell your pizzas successfully. At the end of the year, the contents of the profit box will be transferred to Company Capital after deduction of 20% tax. Here you can see the development of your profits for each day. Telenet is a communication facility for the entire city, similar to the video phone. You can communicate interactively with your business partners via a so-called Telenet terminal. To speak to one of them, press the TELEPHONE key and click on the appropriate Telenet number. The number will then be dialed automatically. You will find all the Telenet numbers in the Telenet directory for the relevant city which is included in the separate city guide. Communication with your business partners is carried out by means of a simple menu dialogue procedure. Yes-no questions can be confirmed with the THUMBS UP key or refused with THUMBS DOWN. In many cases you can choose between different answers. Your business partner at the other end of the line can see you just as you can see him. If you ring an estate agent, the call always refers to the city last selected on the map. If you are in one of your restaurants and phone the estate agent from there, it refers to this restaurant. The estate agent treats business premises and warehouses in the same way. If you want to rent a place, you will have to hand over the money for the first month's rent when signing the contract. The full rent is always deducted from your account in advance even for part months, so make sure that you have the necessary amount of cash available. Thereafter the rent will always be debited from your account at the end of each month. It is also possible to buy premises you have so far been renting. If you have been renting the place for more than a year, the estate agent might even offer you a discount. You should, however, always be careful when buying premises. Some estate agents will try to cheat you and demand a higher price than was stated in the status window. Always make a note of the price you were quoted there and insist on this sum. If you try to sell an object, it is customary practice to deduct between 10 and 20% of the current market price. If you think the estate agent's offer is too low, however, you can always try to push the price up by negotiating. In this case, do not confirm the offer, but click on the THUMBS DOWN key instead. Afterwards you can choose a sentence with which to answer the estate agent. If you ask a bank for a loan, the banker will first look at your financial situation as a whole. Me will consider your solvency, your reputation in society and the property you own (if any). Some banks are more willing to take risks than others and they also charge different interest rates. So it is worth shopping around for the best deal. Once the banker has decided to grant you a loan, he will make you an offer. Via the Telenet dialogue system you can either accept it (THUMBS UP key) or reject it (THUMBS DOWN key). If you have taken out a loan, it will be listed under "statistics" in the financial overview, together with any other important information. The repayment will be deducted from your account every month. You can only take out one loan per bank. You can deposit money at the bank at any time and receive interest on it. If you select this item, the bank will make you an offer stating the amount to be deposited, the term and the interest rate. Again, you can either accept or reject the offer. Transfers are particularly useful for laundering money. They can also be used to lend money to another player. Negotiate with him about the sum in question, the time when he will have to pay it back and, of course, the interest rate. The account numbers of the players correspond to their player numbers. Player No 1 will have account number 111111, player No 2 will have 222222 etc. If you select TRANSFER, a cheque will appear. Enter the sum and the account number on this cheque. Then the banker will tell you whether or not it was possible to carry out your order. The account you have named does not exist. The sum to be transferred is not available in the account. Theft: In case your staff is not as honest as you would wish. Burglary: In case your warehouse is burgled. Fire: Protect yourself against arson and explosions. Personal liability: In case you have to pay a fine. Loss of life: If you die, you will be brought back to life and the insurance sum will be paid out. Unfortunately, this is only possible in the game and not in real life! If you need to make a claim, you should advise the appropriate insurance company of this immediately because you must make your claim by the end of the week - otherwise you won't get anything! The bigger your contributions are, the more likely it is that the insurance company will pay out if the worst comes to the worst. Are you ready to fight your way through the jungle of bureaucracy? How clever are you when it comes to dealing with politicians? Don't worry; you are in a stronger position than you might think because the powers that be depend on you and your donations to their party. You can use politicians to achieve your goals and donate simply to make a name for yourself. The higher your standing in the world, the easier you should find this. But your personality and charisma also play a role in this part of the game. You need to have achieved at least the position of a small entrepreneur in order to be able to talk to the mayor in person. It is not easy to get through to the mayor, but once you have managed it you will receive his account number to transfer your donations to. Party donations are quite normal. A politician needs you like a normal human being needs the air he breathes or like you need your ingredients to bake your pizzas. II you want to talk to the police, you must be at least a "blue-collar worker". The policeman can give you important information, e.g. whether and when an inspector is going to pop round to check the quality of your restaurant, or the next time your central warehouse will be examined. Unfortunately the custodians of the law are usually men of few words, and hide behind a wall of paragraphs and regulations. You have to drop fairly direct hints to make them understand what you are getting at. It wouldn't hurt to make a small donation in advance, just in case you should fall foul of the law some day. These are the local arms dealer and the leading families in town. No, no... not the city's dignitaries, but that honorable society the mafia! From the local arms dealers you can buy both joke articles to be placed in your competitors' restaurants, and weapons you need to burgle a rival or for (illegal) arms deals. Smelly cheese: Lends a very unpleasant smell to any pizzas made from it. Rats: They are sociable creatures in a restaurant, even though some customers might never come back if they see them. Stink bomb: Leaves a terrible stench in the restaurant which lasts three days before it gradually disappears. Flame thrower: Bums everything within a range of about 1.5 meters. Insecticide: Due to its contaminating effect, the restaurant in question will have to close for several days. Bazooka: The projectile will destroy any piece of furniture or equipment it hits immediately. If you want to sell weapons to a dealer, he will make you an offer. You can either accept it (THUMBS UP) or reject it (THUMBS DOWN). If you don't have a central warehouse, you will have to carry your weapons around with you. The risk of getting caught with them is extremely high. Whether the police catch you or not will depend mainly on your "dexterity" value. It is advisable to use any weapons you are carrying with you as quickly as possible or re-sell them. However, if you have established a central warehouse, your weapons will be fairly safe there. You should store them in the warehouse as quickly as you can. Even though there are occasional inspections by the local authorities, you can find out the relevant dates by "persuading" the appropriate politician (see section "AUTHORITIES"). You can only sell weapons you are carrying with you. "I need a job on the side." With the first sentence you make it clear that you are not afraid to take part in illegal dealings. This means that the boss of the clan can assign you a job. For most deals, a meeting point is arranged, and you had better be there on time! Otherwise you run the risk of running into a policeman instead of your contact. All underworld jobs have some risk attached. You will be told how risky it is before you accept your job. Then you have to decide whether you still want to do it or not. If you are caught in the act, the local police will arrest you and either put you into jail or impose a fine, depending on what you were doing. You can only accept ONE task at a time. Courier services: Your job is to pick up goods from a certain place at a certain time and to deliver them to a different place at a different time. Laundering money: You are given a certain sum of money which must be transferred in equal parts to four accounts within a specified time. Use your cheque forms from the bank to do this. And be extra careful - your employer would be very unhappy indeed if there were any differences in the sums or mistakes in the account numbers! You will only be assigned this kind of task if you have achieved the position of a thug. Arms deals: You have to buy weapons from any arms dealer and to take them to an agreed meeting point. You will have to pay for them out of your own pocket. You will be reimbursed when you receive your reward. You will only be assigned this kind of task if you have achieved the position of a pimp. Share deals: You are offered a deal which requires an "investment" on your part. If the deal is successful, you will be paid the agreed amount after a certain period of time. You will only be assigned this kind of task if you have achieved the position of a killer. If you are in a real jam and desperately need money, you can borrow the money from an underworld clan. You will need to have at least the position of an amateur in the underworld to do this. Select: "I need money desperately." 3.7.8.4.3.2.3. 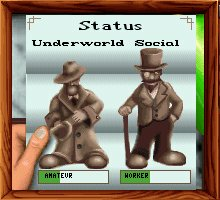 Information from the underworld Select: "I need information." If you can come up with the necessary change, you will get some very useful hints and tips, such as the telephone number of an arms dealer. If you have taken enough actions for today, you can end your day immediately by pressing the SUNSET key. The next player will then take his turn.